Well this is a first for me. I’ve heard much about the rise of real chocolate in the USA, but I have not had the opportunity to try any of it – until now, that is. As the name suggests, Paris Truffles is a company offering elegant and fashionable chocolates. It also has an interesting and quirky range of flavoured 85g chocolate bars which I find particularly appealing. Husband and wife team Robert and Paige Leavitt established the company back in 1984. Robert spent his childhood hanging around in French chocolate shops (somebody’s got to) while Paige travelled the world. They’ve combined their passion for chocolate and world cuisine to make a range of bold flavoured bars. Kettle corn and maple bacon may not be for me, but an emphatic yes to any of the others. I’d certainly like to try the chilli crunch bar – 35% milk chocolate with toasted tortilla and the world’s hottest chilli. I was sent six bars to try and although I didn’t get the chilli bar I’d hoped for, I received two others that contained this indispensable spice. I found the bars really interesting and great fun, but if subtlety is what you’re after, these are probably not the ones for you. These flavours are strong and punchy and I loved them. The smooth couverture chocolate is mixed with the key ingredients in their natural state for added texture. With Christmas just around the corner, these bars would make a fabulous gift or stocking filler for the adventurous chocolate lover. Enter the giveaway below and you might be lucky enough to win six bars for yourself – wherever you are in the world. When I was perusing the Paris Truffles website, the Thai satay bar was the first one that grabbed my attention. How very interesting. So when I found it was in the parcel of bars I received, I was delighted and it was the very first bar I tried. Thai Satay (35%) – sugar, whole milk powder, cacao mess, cocoa butter, soy lecithin, vanilla, peanuts, sesame, coconut, cayenne, Thai birds eye chilli, sea salt. This had an almost savoury scent that was indeed reminiscent of satay sauce. Salty peanut was the first flavour to make its presence felt, followed by the coconut and sesame. It was then the chilli decided to say hello and wow, it had a kick. Not one but two types of chilli in this bar. All this wrapped up in 35% milk chocolate which helpfully allays the chilli – just a little. As regular readers will know, I am a chilli fiend and am often disappointed at how mild some chilli chocolate can be. I was not disappointed with this bar, my mouth and throat glowed for quite some time. Not subtle, but totally moreish. Siena Fig Bar (64%) – cacao mass, sugar, cocoa butter, soy lecithin, vanilla, figs, pistachios, pine nuts, sea salt. I am a fan of both figs and pistachios, so this was the second bar I tried. The first thing I did was breathe in the fruity aroma of figs that emanated enticingly from the packet. Then I broke off a piece and tasted. It was just right with a good balance of fig to salty pistachio, although the pistachios were a little too salty for my palate. The mild 64% dark chocolate showcased the flavours beautifully. A delicious Christmassy chocolate bar. English Garden (64%) – cacao mass, sugar, cocoa butter, soy lecithin, vanilla, French candied violets, basil, Meyer lemon, olive oil, thyme, salt. Thyme was the dominant flavour here, but I could certainly detect the others too. The rich dark chocolate had subtle violet overtones, a sensation enhanced by the crunchy candied violets. I didn’t feel there was a need for salt in this bar. I was, however, heartened to find leaves of thyme contained within the chocolate – a nice authentic touch. Orange Passion (60%) – cacao mass, sugar, cocoa butter. soy lecithin, vanilla, orange zest, passion fruit powder, sea salt. This bar had a strong zesty orange scent which livened up my tastebuds, even before it passed my lips. The chocolate was almost smooth and had a good snap. It tasted of real orange with bursts of tart passion fruit. As with the English Garden, I would have preferred this chocolate without salt – it really wasn’t needed. Salted Almond Toffee (60%) – cacao mass, sugar, cocoa butter, soy lecithin, vanilla, almonds, pure cane sugar, butter, sea salt. I think this was my favourite. Not too salty, and with a nice crunch from the chopped almonds punctuated with little bursts of toffee. The dark 60% chocolate was more noticeable for some reason and felt quite luxurious. It melded well with the caramel flavours. For some not entirely obvious reason, it reminded me of a sophisticated Snickers bar. Raspberry Lime Espelette (65%) – cacao mass, sugar, cocoa butter, soy lecithin, vanilla, espelette chilli powder, raspberry powder, sugar, limes, sea salt. The only word to describe the scent of this bar is gorgeous. It’s a seductive mix of rich chocolate and fruity raspberry that really had my mouth watering. It had a really good snap to it and was smoother than the other bars I tried, although it still had some bits in it. It had a nice level of heat, not nearly as powerful as the Satay bar, but there is no mistaking its presence. The raspberry and lime was a nice combination with neither flavour overwhelming the other, nor indeed, the chocolate. Really quite delicious. Thanks to Paris Truffles for sending me some of their chocolate bars to try. I was not required to write a positive review and as always, all opinions are my own. Paris Truffles Chocolatier have kindly agreed to give one of my readers six bars of their chocolate. To be in with a chance of winning, please fill in the Gleam widget below. You will need to leave a comment on this post, answering the question, which then gives you additional chances to enter if you so wish. Gleam will pick a winner at random from the entries received. If you are commenting anonymously, please give me some way of identifying you as I will be verifying the validity of entries. Any automated entries will be disqualified. This giveaway is open to those living anywhere, but you must be aged 18 or over to enter. Winners will need to respond within 7 days of being contacted. Failure to do this may result in another winner being picked. Prizes are offered and provided by Paris Truffles Chocolatier and Chocolate Log Blog accepts no responsibility for the acts or defaults of said third party. Sherry trifle would make an interesting chocolate bar I think. Penelope Cruz. She’s just so tasty! Linzertorte would make a lovely chocolate bar – almonds, and raspberries (or redcurrants) with a subtle hint of lemon and cinnamon. Add a few cookie pieces to replicate the effect of pastry. Eton Mess would be delicious as a chocolate bar! I adore caramel, so a carmel one would sound delish! However, after reading this post, every chocolate you got sounds like a dream. Apricot tart – I like apricot and chocolate together! Siena Fig Bar and English Garden! 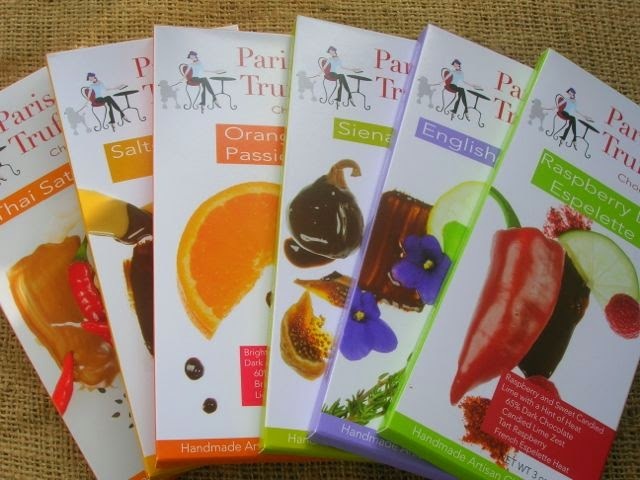 These chocolates sound lovely – great review! Baked Alaska in a chocolate bar sounds lovely! Balck Forest Gateau or a walnut brownie. I can’t get with chilli chocolate no matter how hard I try.Saying that the raspberry, lime and chilli is one which intrigues me so am prepared to give it a go!! I’d like to see a Black Forest Gateau flavoured bar please! I want to try those Thai satay chocolate! Banana Foster Cheesecake, hits the spot! Rhubarb crumble, would make a beautiful chocolate! It is not a meal as such but would love to see a bar with fudge, marshmellows and turkish delight! Strawberry Trifle. It would taste so good. eton mess, its my favourite dessert and would be amazing as a chocolate bar. Pumpkin pie would be interesting. Maybe a chinese sweet and sour dish. Lemon meringue pie – yum! Brandy snaps and cream! mmmm! Brandy snaps & clotted cream.